So in vain of re-creating the flavour of Barcelona’s bustling tapas bars I put together a classic tomato tart for lunch, roasting your tomatoes really intensifies their flavour and locks in the sweetness, even people who aren’t fans of tomato seem to like them roasted, they are a versatile ingredient and well worth a try. Cut the tomatoes into 1/2cm slices and place on a greased baking tray sprinkle with salt and pepper the thyme leaves and drizzle with a little more olive oil roast in the oven for 20 minutes. Lightly flour your surface and roll out the puff pastry to around 2cm thick. Place on a baking tray and lightly score 2cm border into the pastry, prick the inside of the base all over with a fork to prevent from rising. Brush with the beaten egg and bake in the oven for 12 minuets. Remove the pastry from the oven, with a fork press the pastry inside the border down to make level; spoon over the tapenade, carefully layer with the roasted tomatoes lightly cover with foil and return to the oven for a further 5 minutes. Remove from the oven, leave to cool slightly before crumbling over the cheese and topping with freshly torn basil leaves. Puree the raspberries in a food processor then set aside. Place the butter, sugar, lemon zest and juice in a heat prof bowl over a pan of simmering water, stirring until the butter is melted and the sugar is dissolved and the mixture is smooth; this will take about 5 minutes. Allow the mixture cool a little. Put a sieve over the butter and sugar mixture, and push the raspberry puree through into the bowl use the back of a ladle to help. Discard the raspberry pips and do the same with the beaten eggs, stir well. Put the bowl again over the pan of simmering water and stir over a gentle heat for about 15 minutes or until the curd reaches the consistency of lightly whipped cream. The mixture will thicken as it cools. Spoon the curd into two warm, sterilised, Jars I have used 3x 200g kilner jars. 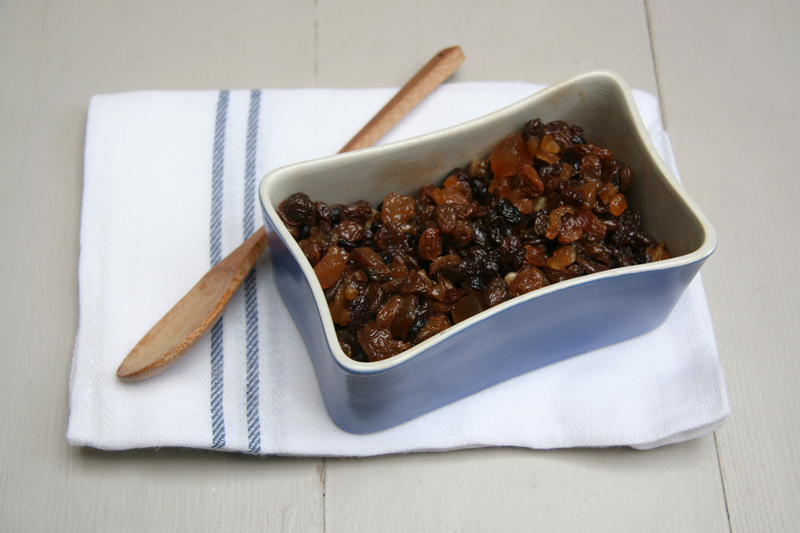 To sterilise jars, wash in hot, soapy water, rinse, then dry in a low oven; alternatively, put through a dishwasher cycle, leave to dry completely. Seal the jars, when the curd is cold refrigerate for up to four weeks. Serve the curd with freshly baked scones or hot crumpets. 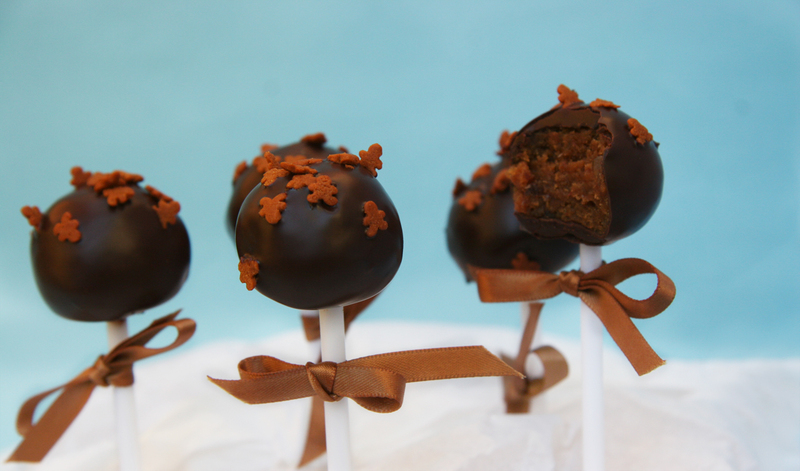 The ginger cake pop’s I made at Christmas were really popular, so I have adapted the recipe for Valentines day. I ordered Wilton’s red candy melts with the intention of making red heart shaped pops, I melted the candy melts down but found the consistency to thick to cover the cake, adding liquid curdles the candy melts as they are oil based so as suggested I added a little oil to thin down, this just resulted in giving a horrible greasy taste to the chocolate coating. I ended up discarding the candy melts and going with 70% dark chocolate which worked perfectly. 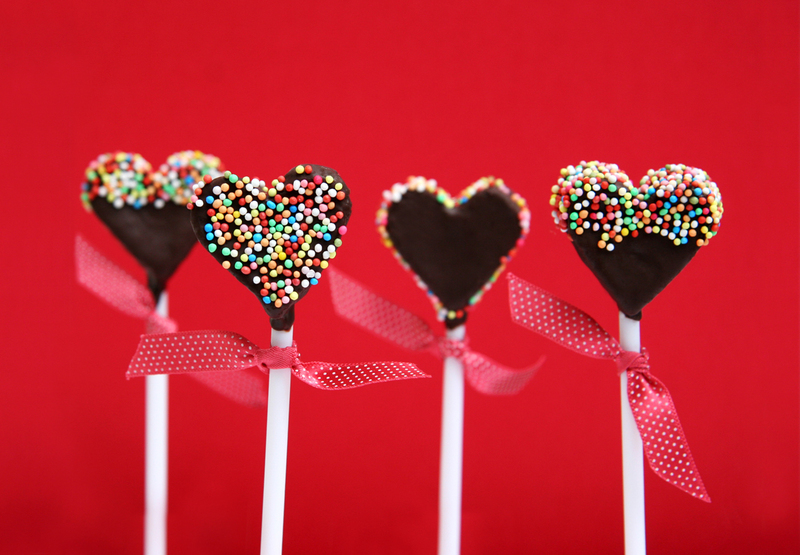 So Valentines cake pop’s turned out to be sweet hearts of chocolate fudge cake, coated in dark chocolate, a lovely home made gift for your Valentine. First make the cream cheese frosting, whisk the softened butter until pale and smooth then add the dried and chopped ginger along with the syrup, whisk again briefly to combine. Sift in the icing sugar and mix to combine in to a smooth thick frosting, cover and leave to chill in the fridge. The frosting will keep well in the fridge in an air tight container. Make up the fudge cake as per the packets instructions, bake and leave to cool. Break up the cake in to pieces, add to a food processor blitz until the cake forms a crumb consistency, add 2tbsp of frosting and mix with a spatula, the mixture should be thick like marzipan. Line a large baking tray with grease proof paper, pat out the cake mix and cover with cling film, roll the mixture out on the sheet to 2cm in thickens. Chill the mixture in the fridge for 20 minuets. Using a heart shaped cutter stamp out the cake heart’s. You will need something ready to rest the cake pops in while the chocolate sets I used tumblers stuffed with some kitchen paper, if you have one a polystyrene block works really well as well. 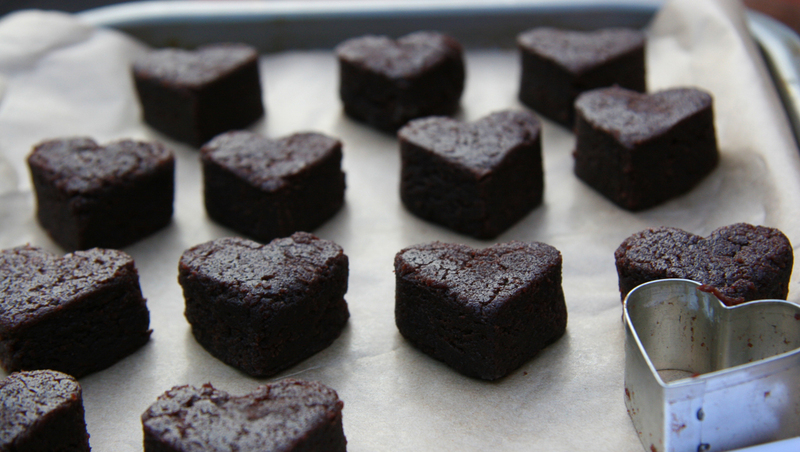 Melt the chocolate in a heat proof bowl over simmering water dip the tip of a lolly stick into the chocolate and secure into a cake heart pushing in about half way then place them back onto the baking tray and allow the chocolate to set. Once the sticks are secure take a cake pop and dip into the melted chocolate making sure you cover the whole surface, lightly tap on the side of the bowl to remove excess chocolate, be patient and allow the chocolate to drip off and keep turning the pop around to keep the surface smooth. Carefully secure in the prepared tumblers and top with sprinkles. Leave to dry. Wrap in cellophane and tie with ribbon. Gingerbread men serve not only as a great decoration for any Christmas tree but baking them fills the house with the smell of Christmas. 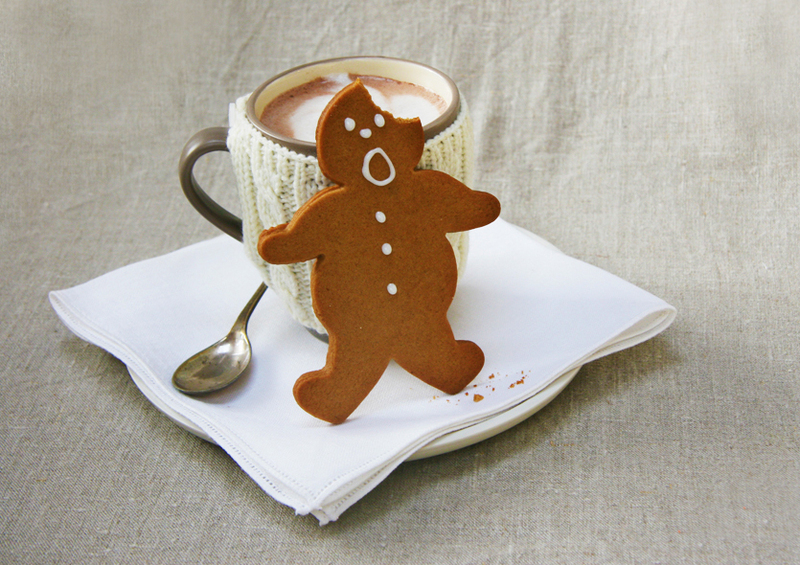 In my mind a gingerbread man need to be crisp, and spiced with ginger, not to soft, not cakey, the ones I remember from my childhood were hard enough to break a tooth on, that’s not what I want but there is as fine balance to be found. I tried out a few recipes and found the one using a lot of golden syrup or treacle in them went too hard, the recipe below was recommended to me by my dear friend Jody at Boolas Bakery and solved all my problems the little men turned out to be delicious. To make the icing sift the icing sugar into a bowl place the egg white in a separate bowl and add the icing sugar 1 tablespoon at a time, beating well with a wooden spoon after each addition, stir in the lemon juice-you should be able to squeeze the icing through a piping bag with a fine nozzle attachment. Heat oven to 200C gas 6 line two baking sheets with parchment paper. Sift together the flour, spices, bicarbonate of soda. Melt butter, sugar and syrup in a pan, add this to the dry ingredients. Mix together until the mixture forms a dough, leave to rest until just cool enough to touch. The cooler the dough gets the more difficult it is to work with so work quickly. On a floured work surface roll out the dough to about 5mm thick. 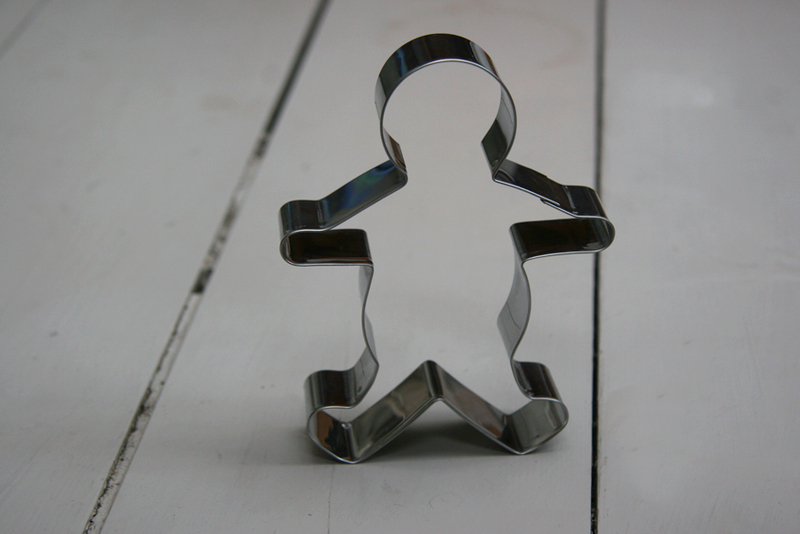 Stamp out gingerbread men with a cutter, carefully lift onto the baking sheets with a pallet knife, press the trimmings back together and roll out again. If you want to hang them on tree remember to use a straw to punch a hole in the top. 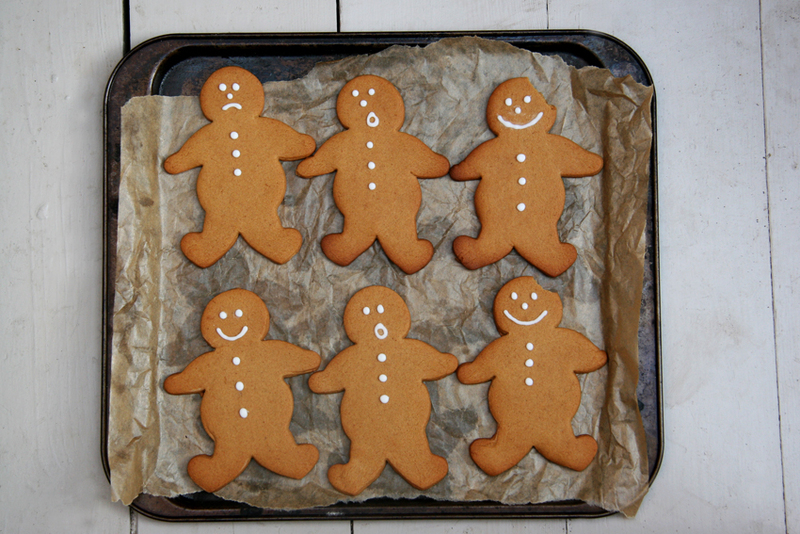 Leave to cool on the baking tray Ice faces on the gingerbread men to give them some personality, thread with ribbon and hang on the tree. Now I didn’t love Panettone, until I had a good one, I think this is because I hate candied peel, and most seem to be full of it, but when the balance is right Panettone is a delicious treat and I can forgive a bit of peel (however I have left it completely out of my recipe). 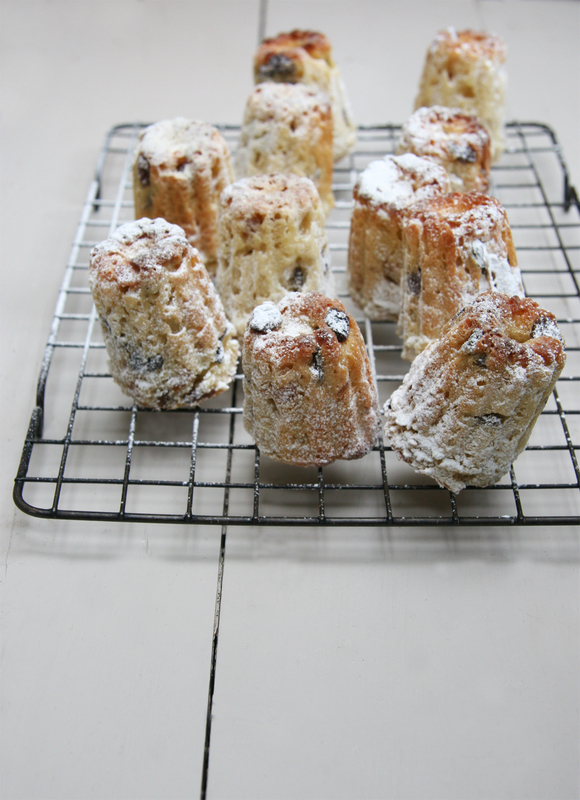 These mini Panettone’s are on my list of home- made goodies I will be giving to family and friends this Christmas and is pretty much a store cupboard recipe. I used silicone rumbarba moulds bought from Habitat called poppy. I wanted a traditional scalloped shape to my Panettone in a mini form. You can easily use muffin tins or the recipe makes and large Panettone in an 8inch spring form cake tin, in both cases line with grease proof paper and brush the tops with egg and milk wash before baking. A large Panettone may need 10 minutes adding to it’s baking time. Heat the milk until warm to touch, remove from the heat and add the yeast and 1 tsp of the sugar, mix well and leave to activate about 5 minuets, the mixture will form a thick foam on top. In a large mixing bowl add the flour remaining sugar and salt. Make a well in the centre, add the milk and yeast mixture, beaten egg, honey, vanilla, Grand Marnier and butter mix first with a wooden spoon to bring together, and the with your hands to form a smooth soft dough mix for about 5 minuets. Drain the fruit and pat dry with kitchen paper, add to the dough along with the lemon and orange zest, mix through the dough until well distributed, turn the dough out on to a floured work surface and knead for 1 minute, shape in to a ball place back in the mixing bowl cover with cling film and leave to rise in a warm place of 40 minutes or until doubled in size. Bake in the bottom third of the oven for 30 minutes. Leave to cool in the tins for 5 minutes, turn out on to a wire rack to cool completely. 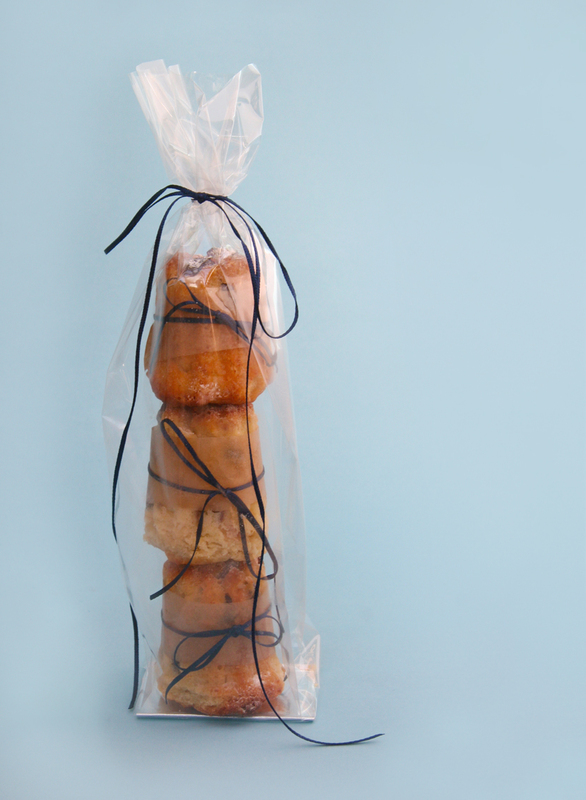 Wrap in cellophane and ribbon for great homemade gifts. After hearing so much about Cake pops I was dying to make some, they are essentially cake truffles on a stick, very simple to prepare and far more delicious than I imagined! 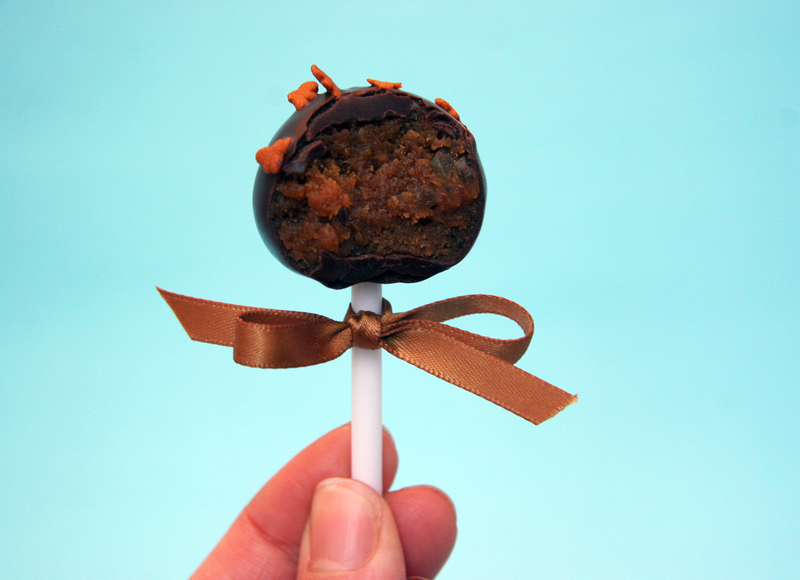 As I have decided to make most of my Christmas gifts this year I thought Christmas Cake Pop’s would be a good starting point, of course I needed to test out a recipe before giving them as gifts. Finding gingerbread men cake sprinkles online sold me on the idea of dark chocolate and ginger as my flavour, a bit grown up but still fun , cakes cookies and crafts﻿ have an amazing selection of cake decorations, packaging everything you could ever need really. Looking online most recipes were American and use ingredients such as candy melts and cake mix not readily available in the UK, and expensive to order online. I used 70% dark chocolate it didn’t crack, worked perfectly and McVittie’s ginger cake, was exactly what I needed it’s moist, sticky, was a good base to work with, and meant no baking. First make the ginger frosting, whisk the softened butter until pale and smooth, add the dried and chopped ginger along with the syrup, whisk again briefly to combine, sift in the icing sugar and mix to combine in to a smooth thick frosting, cover chill in the fridge. The frosting will keep well in the fridge in an air tight container. Break up the cake in to pieces, add to a food processor blitz until the cakes forms a crumb consistency, add 2tbsp of ginger frosting and mix with a spatula, the mixture should be thick like marzipan. 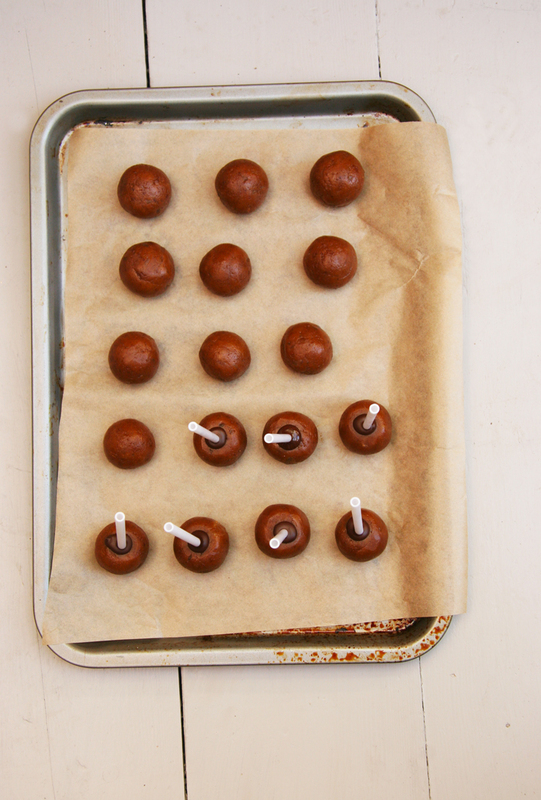 Line a large baking tray with grease proof paper Dampen your hands and roll the mixture into walnut size balls and space out on the baking sheet, my mixture made 18. Chill the mixture in the fridge for at least 1 hour. You will need something ready to rest the cake pops in while the chocolate sets I used tumblers stuffed with some kitchen paper, if you have one a polystyrene block works really well. Melt the chocolate in a heat proof bowl over simmering water dip the tip of a lolly stick into the chocolate and secure in to a cake ball pushing in about half way place back the baking tray and allow the chocolate to set. Once the sticks are secure take a cake pop and dip into the melted chocolate making sure you cover the whole surface, lightly tap on the side of the bowl to remove excess chocolate be patient and allow the chocolate to drip off and keep turning the pop around to keep the surface smooth. Carefully secure in the prepared tumblers and top with sprinkle. Leave to dry. Wrap in cellophane and tie with ribbon. Cake pops will keep well for a couple of weeks. Sieve the flour on to your work surface, make a well in the center, break the eggs in to a jug and lightly wisk, pour into the well of flour. 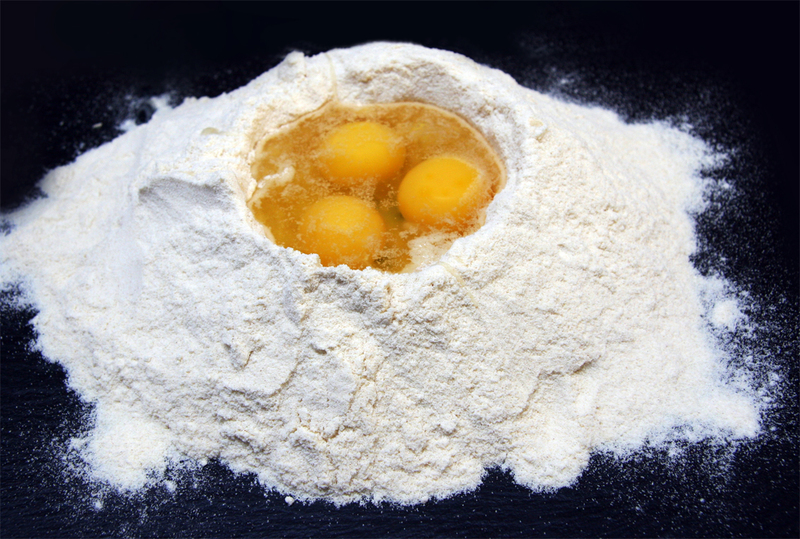 Using the tips of your fingers, mix the eggs with the flour incorporating a little at a time, until everything is combined to form rough dough. On a floured surface knead the dough pulling it, stretching it, until it becomes smooth and silky, this will take about 10-15 minuets . Wrap the dough in Clingfilm and put it in the fridge to rest for at least half an hour. Divide the dough in to 8, using a pasta machine starting with the thickest setting, and working through to the thinnest, roll out each ball of dough into sheets dusting with plenty of selomina after each setting. In a dry pan lightly toast the pine nuts until just brown, seat aside and to the pan add the sunflower oil and heat, carefully drop in the sage leaves, taking care as they will spit, fry until crisp remove from the oil and drain on kitchen towel. 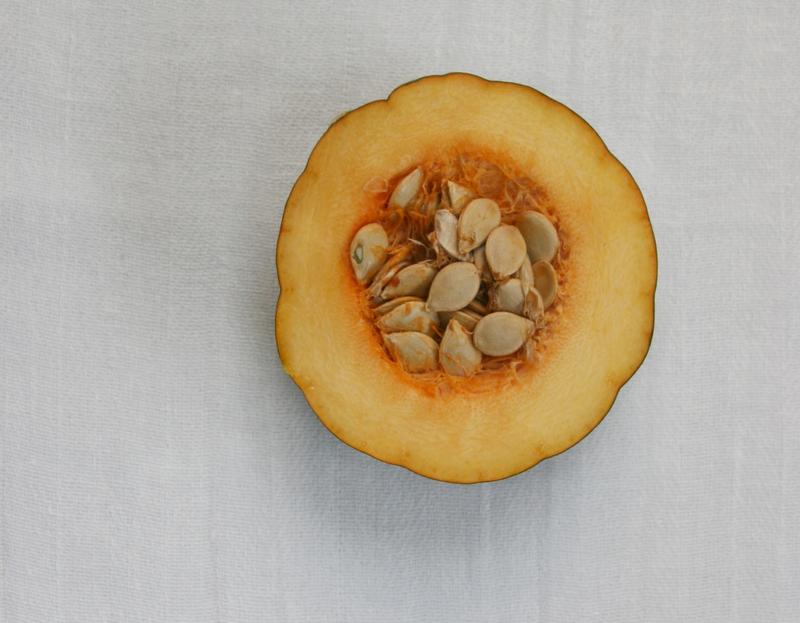 Cut the pumpkin into chunks and lay on a baking sheet with the garlic, drizzle 2 tbsp of the oil used top fry the sage leaves and honey season with salt and pepper , scatter a few sage leaves on top and roast in the oven at 180c gas 4 until the pumpkin is soft. Remove from the oven allow to cool a little before peeling the skin from the pumpkin, add to a blender bowl the pumpkin flesh, roasted garlic squeezed from it’s skin, the ricotta, breadcrumbs, nutmeg salt and pepper. Blend until just combined, add the egg yolk and blend again briefly to mix. 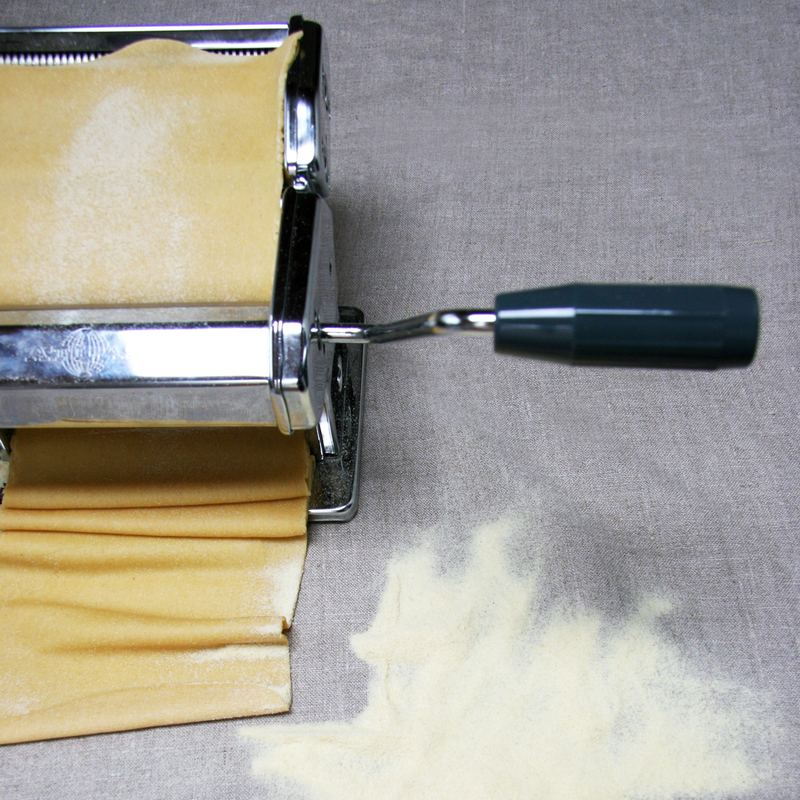 Lay a sheet of pasta dough out onto a work surface dusted with semolina, brush with water using a pastry brush. Place teaspoons of the pumpkin filling onto the pasta sheet 8cm apart. Lay another sheet of pasta on top using a small glass just bigger in diameter than your filling lightly press down to seal the filling between the two pasta sheets, taking care not to cut through the dough. Using a pastry cutter, cut out each circle to make your ravioli, thumb round the ravioli edges with your fingers to seal. Lay in a single layer on a baking sheet dusted with semolina. Melt the butter in a pan, cook until lightly browned, fragrant and nutty smelling. 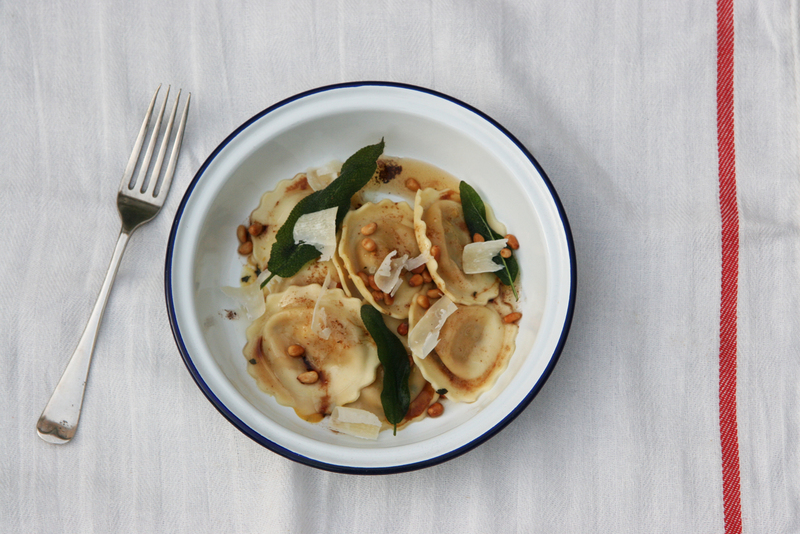 Remove from heat, and let it cool off for a minute then add the balsamic and a pinch of salt, pour over the ravioli top with the toasted pine nuts sage and parmesan. 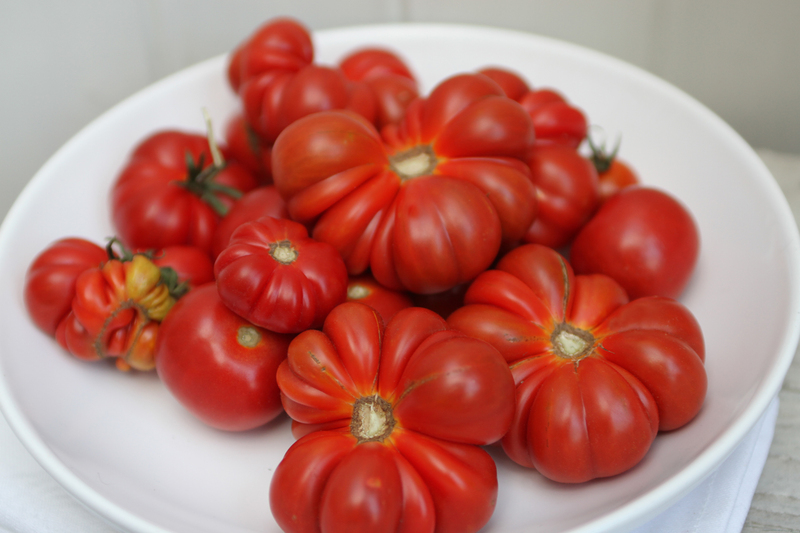 Tomatoes are in season right now and while I have far more green than red thanks to recent lack of sunshine the beefmaster tomato pictured below were our biggest success and looked and tasted amazing. I put together a classic tomato tart for lunch the other day, roasting your tomatoes really intensifies their flavour and locks in the sweetness, even people who aren’t fans of tomato seem to like them roasted, they are a versatile ingredient and well worth a try. 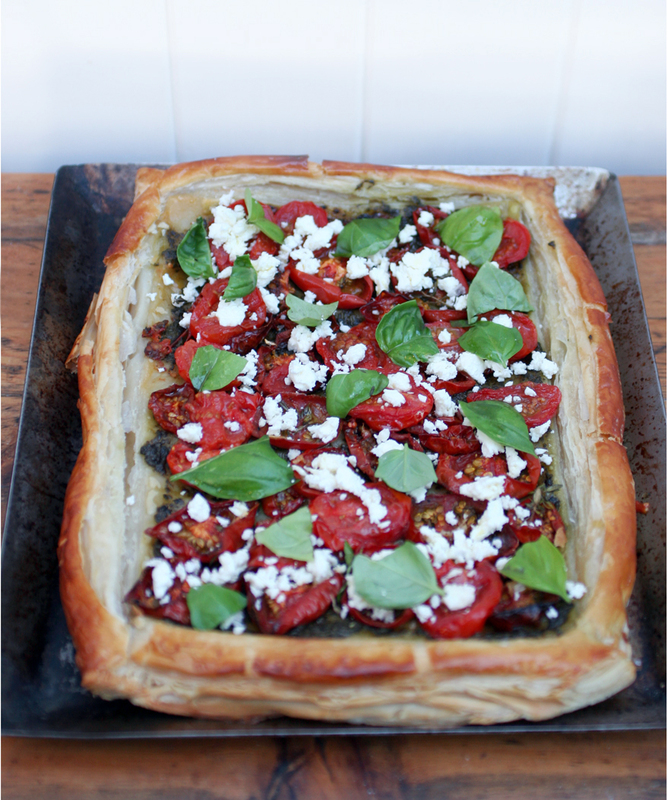 Remove from the oven, leave to cool slightly before crumbling over the feta and topping with freshly torn basil leaves. 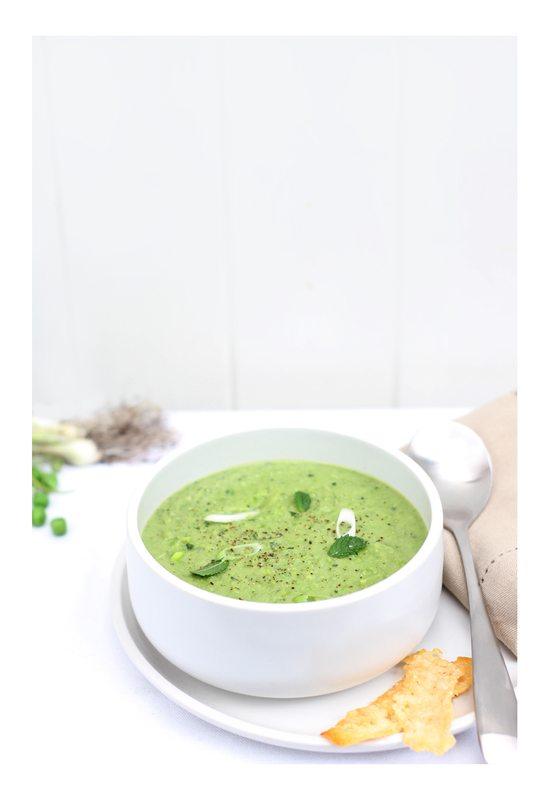 The first recipe I am to share with the world is Pea & Mint Soup, in hope of keeping the summer spirit alive. 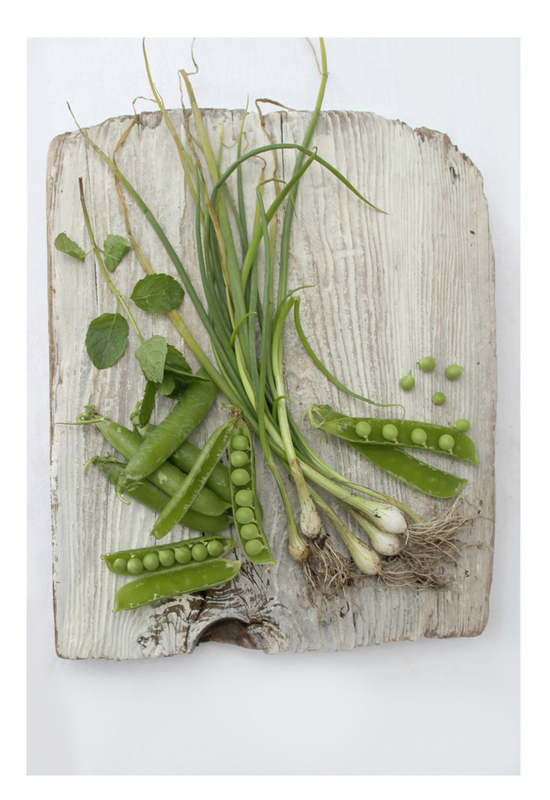 Petits Pois are in season and in my garden so I thought a good place to start. Freshly shelled and cooked they are delicious, the little pea’s in their pods are so pretty and worth the labour of love podding by the dozen. I am really chuffed I managed to grow some this year and have been adding them fresh from the pod to salads, with the rest of my crop I decided to make a summer soup. With handfuls of spring onions donated from my granddads garden I’m ready to get podding! Heat the olive oil in a large saucepan, peel and dice the potato and roughly slice the spring onions, add to the pan and fry of 2 minutes. Pour over the hot stock, bring mixture to the boil and simmer 10 minutes or until the potato’s are tender, add the peas and cook on a medium heat for a further 2 minutes. Remove from the heat add the picked mint leaves and blend until a smooth, season with salt and pepper. Line a baking sheet with grease proof paper, divide the grated parmesan into 6 strips across the baking sheet, and place under a hot grill. The parmesan will quickly begin to bubble and brown so keep a keen eye on it, once slightly brown remove from the grill and leave to cool slightly, carefully remove the parmesan crisps from the paper with a palette knife, serve alongside the soup.